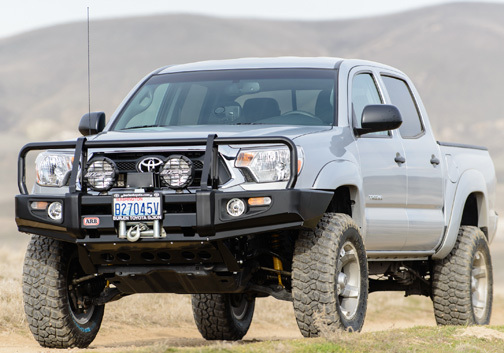 To allow fitment to the 2012 & On Toyota Tacoma, the previous Tacoma ARB Deluxe Winch Bar had to be redesigned with a number of small changes. The main changes were in the protection tubing to prevent the obstruction of the headlight beam from the updated Tacoma headlight system. Another change had to be made to the top of the bumper. The 2012 On Toyota Tacoma grill hangs further forward which interfered with our previous bumper. This was fixed by adding additional clearance between the ARB bumper and grill and utilizing a trimmed portion of the factory Tacoma bumper. This new bar incorporates all the same features as the previous model. Will accommodateWarn low mount model electricwinches.